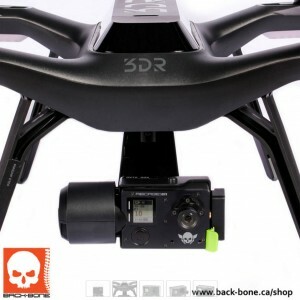 Back-bone wh o are best known for their Ribcage replacement shell for the GoPro have announced a 3DR Solo specific version called the Ribcage Air. The Ribcage Air is made from machined aluminum plates that are 50% lighter than the standard Ribcage, as such it’s far more suited to GoPro gimbals. Along with the new Ribcage comes the Dead Weight, a 3DR Solo specific kit that allows for precise balancing to support use of various lenses or filters that cause the weight and balance to differ from the stock GoPro performance that the Solo gimbal will be tuned to best support. Most Solo owners replacing their lenses tend to go for around 4.35-4.4mm lenses, Back-bone have a bundle with a new 4.2mm (slightly wider field of view) which is claimed to be very sharp.